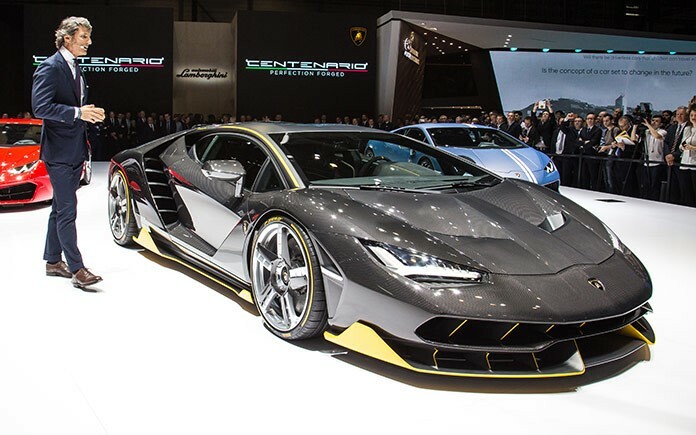 Lamborghini presents the Lamborghini Centenario at Geneva Motor Show, in the year the company celebrates the centenary of founder Ferruccio Lamborghini’s birth. The Centenario’s pure and essential lines are evident in a new design language throughout, demonstrating the quintessence of Lamborghini’s commitment to ‘form follows function’. The car has a permeability, defined by the intakes, outlets and ducts that mark its aerodynamic superiority. A mono line from front to back defines the recognisable Lamborghini contours, with long, low overhangs front and rear creating a clean, sensuous, mono-body shape. The Centenario measures 4.924 m long and 1.143 m high. Aerodynamic inlets made of several fins characterize both front and rear. Large air scoops in the front bonnet, while reminiscent of 1970s sports cars, are there for functionality: air is taken in through the car’s front contributing to downforce on the front axle. The body of the Centenario is defined in a gloss carbon fibre. The front bonnet, scissor door panels (always reserved for V12 models) and roof line are fluent, aerodynamic and organic: the lower parts in matt carbon fibre are functional, technical and dedicated to aerodynamic superiority, including front splitter, side skirts, wheel arches and rear diffuser. The irregular wheel arches, both front and rear, are a defining feature of the Centenario, as they have been in other Lamborghini models. Accented in matt carbon fibre and concealing airflow ducts, they highlight the aerodynamic design of the car. The profile of the rear wheel arch particularly attracts attention, accentuating the Centenario’s rear-wheel steering. Pirelli PZero tyres, developed specifically for the rear-wheel steering, sit on exclusive 20”/21” front/rear rims in forged and milled aluminium. 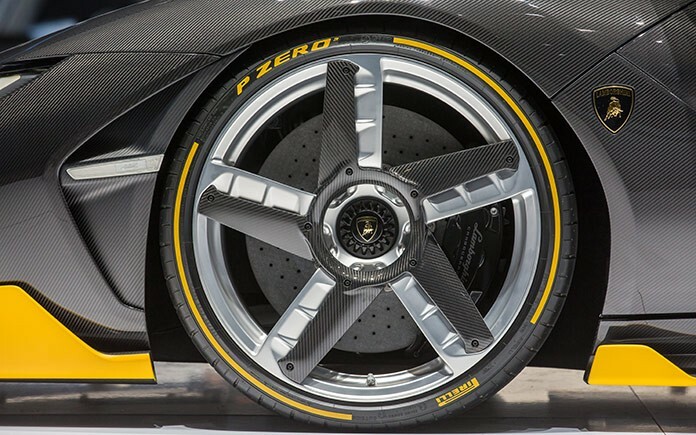 The spokes’ fan shape, accented in carbon fibre, mask ducts extracting hot air from the carbon ceramic brakes, finished with a central-locking wheel nut sporting the Lamborghini bull logo. The integrated rear diffuser dominates the back of the car, its substantial dimension optimising air flow distribution, maximising the car’s downforce and aesthetically emphasising the importance of aerodynamics in the Centenario. Like many mechanical parts around the car, exposed to maximise heat exchange, the rear tyres are visible, while floating in the void above the diffuser are the Centenario’s ‘Y’-shaped rear lights. Seemingly suspended in air but attached at each end of the ‘Y’, the LED lights stretch the full width of the rear. The Centenario is as distinct at night as it is during the day. An extendable rear wing is integrated in body when stationary or at low speeds to preserve the minimalist lines of the Centenario. According to vehicle dynamic conditions and Driving Mode chosen, the wing extends to 150mm and rotates up to 15 degrees for optimal aerodynamic efficiency in high performance conditions. The Centenario takes Lamborghini’s V12 engine as its powerplant, perfectly matching the dynamic potential of the car. The highly responsive engine, even at low revs, provides the unmistakeable resonance and characteristics that only a naturally aspirated engine can. 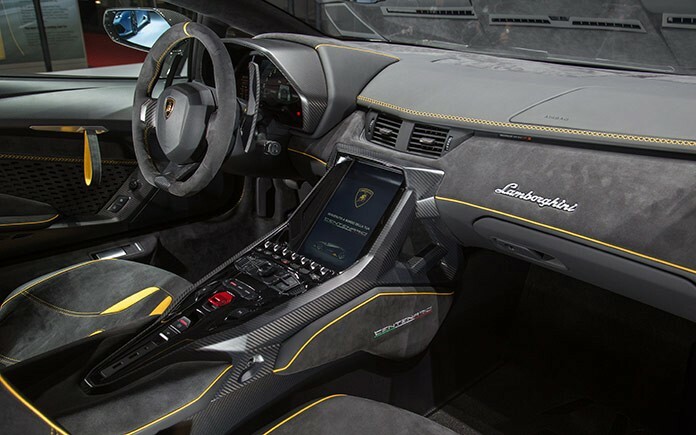 Uprated to provide an output of 770 hp (566 kW) and with the engine speed limiter raised from 8,350 rpm to 8,600 rpm, the Centenario’s is the most powerful engine produced by Lamborghini to date. Accelerating from 0-100 km/h in just 2.8 seconds and from 0-300 km/h in just 23.5 seconds, the Centenario’s top speed is more than 350 km/h. Braking distances are equally impressive: from 100- 0 km/h in just 30 m and from 300-0 km/h in 290 m.
The body of the Centenario is built entirely in carbon fiber, with a monocoque and all other body parts and trims in carbon fiber. 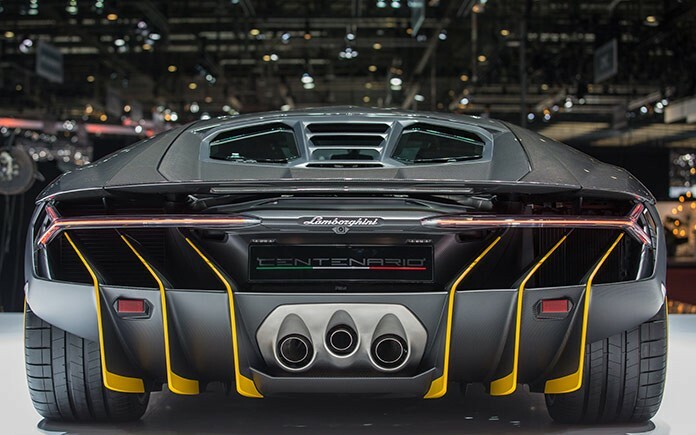 With a dry weight of just 1,520 kg, the Centenario achieves a weight-to- power ratio of 1.97 kg/hp and a torsional stiffness of 35.000 Nm per degree. With permanent four-wheel drive, the Centenario adopts a new Lamborghini rear-wheel steering system. At low speeds the rear tires turn in the opposite direction of the steering angle which leads to a virtual reduction of the wheelbase. This provides increased turning agility at low speeds, requiring less steering angle and a reduced turning radius. At high speeds the rear tires turn in the same direction of the steering angle which leads to a virtual increase of the wheelbase. As a result the rear-wheel steering provides increased stability and optimises vehicle response. In the three Lamborghini driving modes, Strada, Sport and Corsa, the rear-wheel steering heightens the characteristics of each, particularly in lateral dynamics. 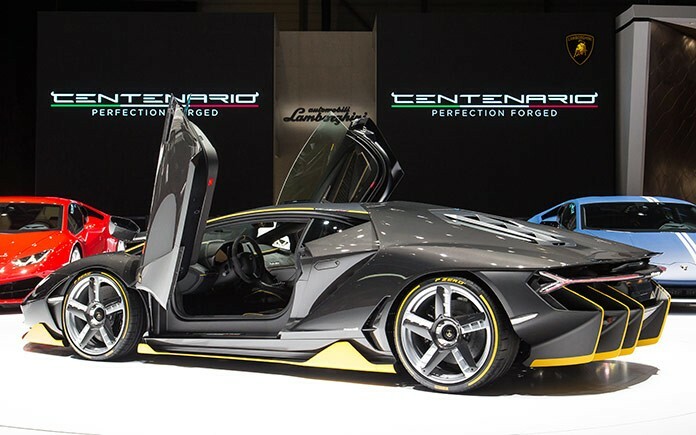 The Centenario is fitted with Lamborghini’s magneto rheological suspension and Lamborghini Dynamic Steering (LDS), especially tuned for the Centenario’s rearwheel steering and providing optimal responsiveness and driver feedback. Transmission is via Lamborghini’s Independent Shifting Rod (ISR) gearbox, providing a lightweight and emotive solution to achieving the fastest gearshifts possible. The luxurious interior can be finished to each Centenario client’s specification. Sports seats in lightweight carbon fiber are included, with new stitching that features on the length of the dashboard, steering wheel, sunvisors, rocker covers, and the new inner door panels made of carbon fiber and Alcantara. The Centenario will be produced as a limited edition, with only 20 coupés and 20 roadsters to be delivered from autumn 2016 and throughout 2017. All 40 Centenario models are sold, to collectors and Lamborghini enthusiasts around the world at a start price of 1.75 million euro plus tax. The company OPAC has been an important partner involved in the new model’s construction together with Lamborghini’s Research & Development department.